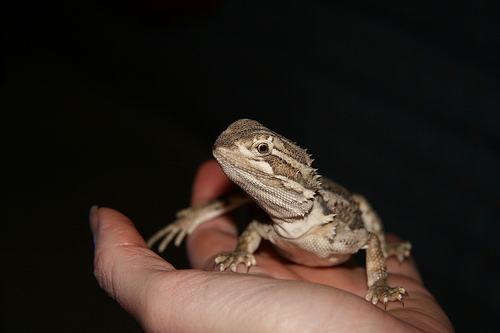 Often referred to as miniature bearded dragons, the Rankins or Lawson's dragon is actually a separate species, Pogona Henrylawsoni, and is named after the Australian author, Henry Lawson. The Rankins Dragon, as it is popularly called in the US, was first formally described in 1985 and its official name is still under dispute. For clarity within this website and article, the Pogona Henrylawsoni will be referred to as the Rankins Dragon. Native to Australia, their natural habitat is arid, rocky and hot. Contrary to popular belief, they do not naturally live in sandy deserts, and a sand substrate is not recommended for them. e housed in its own enclosure, Rankins are generally social lizards and seem to do better in small groups. It is uncommon for Rankins to fight or injure each other, and they do not display the aggressive breeding behaviors that bearded dragons have, although just as in any species there are rare instances of dominant male behavior. The minimum housing requirement for a pair of Rankins is a 20 long enclosure, but they would likely be more comfortable in a 30 or 40 gallon breeder tank. Unlike bearded dragons, Rankins are water loving and should have a water dish in their enclosure at all times. If you make the water bowl large enough you may even find your Rankins taking an occasional swim! They require a desert-strength UVB such as the ReptiSUN 10.0 linear tube or the Arcadia 12% linear tube. Compact/coil UVBs are not recommended for Rankins, as the UVB quality and gradient is not sufficient. Provide a bright basking light on the same side of the enclosure as the UVB, with a basking surface temperature of 95-100*F. There should be a temperature gradient in the tank with a cool side temperature of approximately 75-80*F, which would be on the opposite end of the tank than the hot basking area. Rankins are active and curious and do best when they can see outside of their home at the activity in the rest of the room. The humidity in their enclosure should be measured with a digital hygrometer and should never go above 50% in order to prevent upper respiratory infections. They should also be provided with a small, dark hide on the cool side so they can escape the heat of the day or sleep and get away from the lights. The average size of a full grown Rankins Dragon is approximately 10" long. They are avid hunters and will chase crickets and roaches, but also enjoy soft bodied worms. Due to their small size, they require small feeders! A good rule of thumb is to keep the length of the feeder the same as the distance between their eyes, to prevent intestinal problems and impaction. Good feeders for Rankins are dubia or discoid roaches, crickets, silkworms, butterworms, waxworms and small superworms. They are omnivores and should also have some vegetable matter in their diet. A good rule of thumb is to feed turnip greens, collard greens or mustard greens in the early morning, and protein feeders during the day. Some Rankins will refuse to eat their greens if they were not raised eating them from babies, and this can be a struggle, but offer greens to them and often they will learn to eat them. Rankins have the same shed pattern as the bearded dragon in that they will begin to turn a lighter or a grey color and will progressively look as if they have a white 'second skin.' They do not require your help to shed, and their old skin will loosen and shed naturally in due time. At times, some parts of their body will be in shed while other parts are not, and that is perfectly normal. A weekly soak or bath is good for your Rankins and will help to keep them clean and hydrated, as they absorb water through their vent. To make them a bath, use the tub or a plastic bin and put just enough warm water in so that it goes almost up the the armpits, but that they can safely stand in, and let them be in the water for about 15 minutes. With some encouragement, Rankins will usually drink from their bath water. Do not use any soaps on your dragon, and dry them off with a towel before putting them back in their home. The average lifespan of a Rankins Dragon is 6 years in captivity. The Rankins pictured to the left is a male sub-adult Rankins with severe neurological deficits. He is unable to walk and lacks control of his arms and legs. He currently lives in a rescue as a foster and requires adaptive equipment in his home so he can hunt and bask without injury. 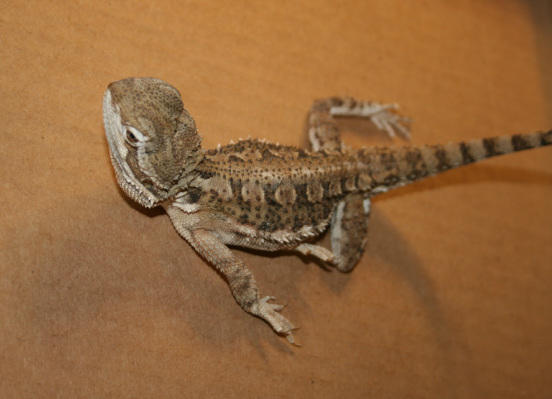 Due to the Australian ban of reptile exports, the Rankins Dragons are rather scarce and the genetic lines are extremely close. This means that your Rankins can very likely be related to someone else's. Please do your research and consider whether you are conscientious enough in your breeding plan to make absolutely sure your Rankins are not related prior to breeding them. Neurological problems are becoming prevalent in the Rankins and this is thought to be primarily due to inbreeding. Prior to breeding any reptile, it is advised to be able to trace each reptile's genetics back 5 generations to confirm that you are in fact breeding unrelated reptiles. This breeder keeps accurate genetic information so if you are a breeder and would like to make sure you are not inbreeding, they will check for you.